Michelle Schill has spent much of her career defending contractors and corporate entities in construction defect, product liability and premise liability matters. She recently successfully co-defended her general contractor client against multimillion dollar False Claims Act litigation, which involved a presentation to a San Diego governmental entity. Schill successfully obtained a defense verdict on behalf of her general contractor client in a six-week trial on negligence and breach of contract claims. She also successfully defended a general contractor client in a high exposure personal injury claim. Schill was recognized as a Young Attorney in 2011 by The Daily Transcript. She has defended numerous contractors in construction defect matters and construction site accident cases, including many multimillion dollar claims. Schill serves as a consultant to her contractor clients to provide contract review/drafting and assisting project managers in obtaining all contractual and insurance documents during construction. Schill also heads the hospitality law practice at Martinez & Schill, where she represents restaurants, hotels, bars, night clubs and lounges in business formation, obtaining liquor licenses and contract negotiation. She also has extensive experience in litigating personal injury, product liability and professional liability matters. Consumer Attorneys of San Diego; Lawyers Club of San Diego, San Diego County Bar Association; Association of Business Trial Lawyers. Schill spends her free time with her family, chasing her 2-year-old son, Alexander, around the city of San Diego. Don't miss out on this wonderful opportunity to recognize your peers or congratulate attorneys from your firm. 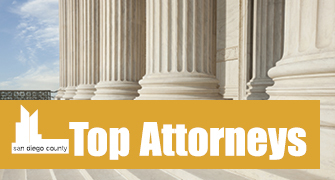 Highlight your firm's expertise by advertising or sponsoring Top Attorneys 2014. Call 619-232-4381, email contact@sddt.com, or see our flyer for more information today!